by Byron Bixler Oculus is about an evil mirror. Except it isn’t really about an evil mirror, it’s about the divide between two siblings. Except it isn’t really about two siblings, it’s about mental illness and the delicate high wire act that comes with surviving horrendous trauma at an early age. Here we have a young man named Tim (Brenton Thwaites) who has just been discharged from a mental facility and put into the care of his sister, Kaylie (Karen Gillan), who has recently secured an antique mirror. The ominous-looking artifact has a sinister connection to events these siblings suffered through in the past and Kaylie is obsessed with it. But Tim doesn’t share her curiosity and wants nothing to do with the mirror. But, after much persuasion, he’s roped into helping his sister set up an experiment to prove the object’s murderous power and ultimately destroy it. Tim approaches the situation rationally, attempting to convince his sister that the mirror isn’t anything but a coping mechanism that she’s allowed to fester in her mind since their father killed their mother while supposedly seduced by its energy roughly a decade before. The debate over the validity of her claims rages on, but then it becomes apparent that something more sinister is at play. This film was originally marketed as a standard “ghouls and jump scares” movie and pushed out in April of 2013 to halfway decent reviews, middling audience reception and unremarkable box office numbers. But it’s so much more than its generic TV spots and lukewarm reception might suggest. As a mainstream horror flick, the terror is relatively understated, stemming from a proclivity for clever mind games rather than shallow shocks and gore. On top of that, its human drama is every bit as compelling as the spookier material is. Oculus is great stuff. It roots itself in two mentally suffering characters and their painful memories, smartly keeping the details of the horror they face blurry and tightly connects the twin storylines through a non-linear structure and playful transitions. Nothing is ever solid, as we constantly get two versions of moments playing out (past and present) and the intermingling of the two elements only adds to the audience’s feeling of instability. The mirror premise sets up an environment where anything can happen and the safety you may find yourself clinging to in a relatively calm scene can instantly be shattered when the reality is unveiled. That sort of thing is extremely unsettling and it’s wonderful to see the filmmakers refuse to exploit it with constant noisy jump scares and laughably overwrought “shocking” occurrences. Instead, there’s a continuous hum of dread and an escalating sense of futility. The psychological aspects elevate everything and they’re fun to follow along with. The idea of a mirror — something that yields a true, unvarnished reflection of what stands before it — as the centerpiece and villain of a story dealing with possibly distorted memories and acceptance of the past as well as acceptance of oneself is really interesting. And while the film makes it clear that the mirror’s power is real, the subtext is present throughout. Our protagonists are not just pretty-faced 20-somethings meant to be put through the ringer, either. They’re both three-dimensional — vulnerable to emotions and reactions that render them barely more adult than they were when the initial trauma took place. 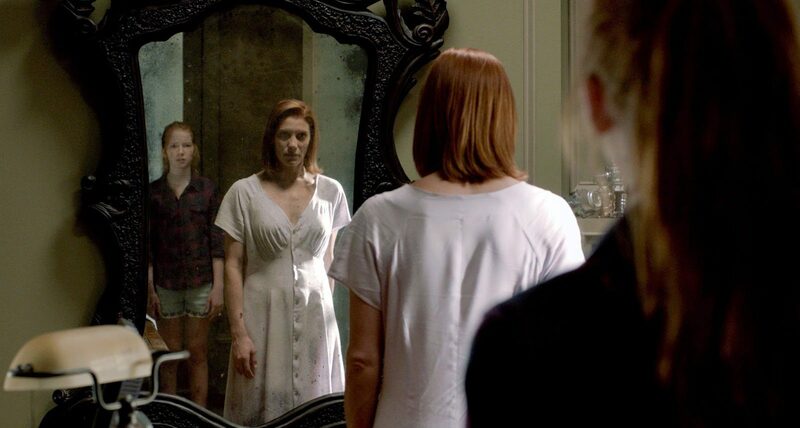 Special shout-outs must go to the pair of young actors (Annalise Basso and Garrett Ryan) who give a couple of the best child performances in recent memory as well as to the cinematography, which is sleek and elegant in a way that we don’t see much in multiplex horror fare these days. If you’re a fan of psychological drama and don’t mind a few creepy scenes or if you’re a horror fan who slept on this when it was released, give Oculus a chance. And keep an eye on Mike Flanagan (Hush, Ouija: Origin of Evil) for more exciting contributions to the genre.